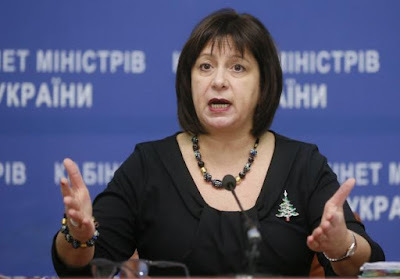 DAVOS, Switzerland -- Ukraine plans soon to launch a fresh diplomatic initiative to recover the Crimean peninsula from Russia which annexed it in 2014, Finance Minister Natalia Yaresko told Reuters on Wednesday. Ukraine's Finance Minister Natalia Yaresko speaks during a news conference in Kiev, Ukraine, December 30, 2015. "We don't agree that Crimea has gone. This will be the year we really begin pressing forward on a process to return Crimea," Yaresko said on the sidelines of the World Economic Forum in Davos. Russia seized the Black Sea peninsula in March 2014 in a military operation denounced by the West, which imposed retaliatory sanctions to punish Moscow that remain in place. More recently Ukraine cut power supplies to the region and its president, Petro Poroshenko, said power would be restored if Crimea were recognized as part of Ukraine. However, Russia has given no sign that it would ever consider returning Crimea, which has a majority ethnic Russian population and holds a special place in Russian history and culture. Last month Moscow issued a new banknote dedicated to Crimea. Yaresko said Ukraine aimed to create a forum along the lines of the so-called Geneva format, a body that included Russia, Ukraine, the European Union and the United States and operated briefly in 2014. Russia has ruled out reviving the forum. "We are looking to establish something bigger than the Geneva format to begin dialogue on how to return Crimea to Ukraine," Yaresko said. Some legal experts believe Ukraine can successfully use Crimea's annexation as a lever against Russia if Moscow carries out its threat to take Kiev to a British court over non-payment of a $3 billion debt. Yaresko declined to comment on that possibility.